Among the four gateways, this western one is in better condition. Though the minarets and many other features were lost. Tthe roof is still intact. The western gateway of Drummond Ganj. Pilibhit is located fifty-five kilometers south of Bareilly is North Eastern most district of Rohilkhand division, Uttarpradesh, India. In 1879, Pilibhit was created as the separate district from Bareilly. 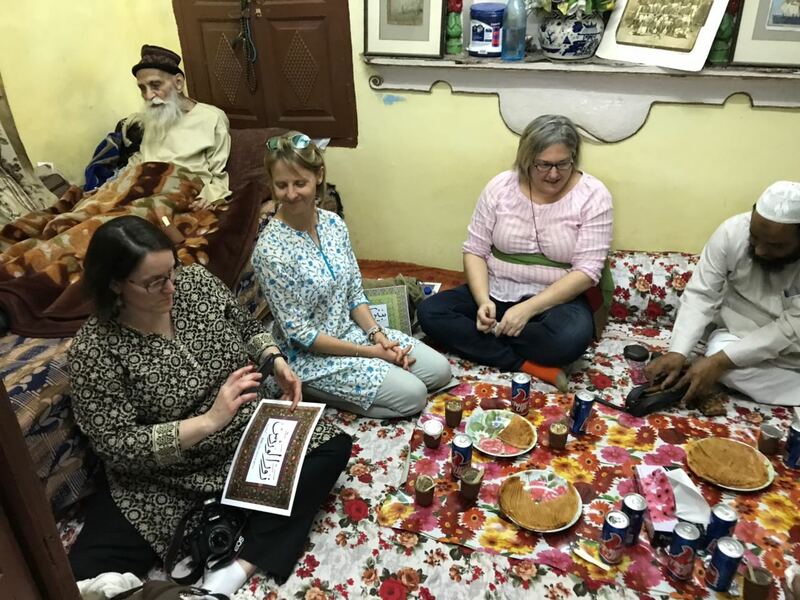 Little is known of the main city before the settlement of Ruhela Afghans especially when Hafiz Rahmat Khan who made it as the capital of Rohilkhand in 1740. 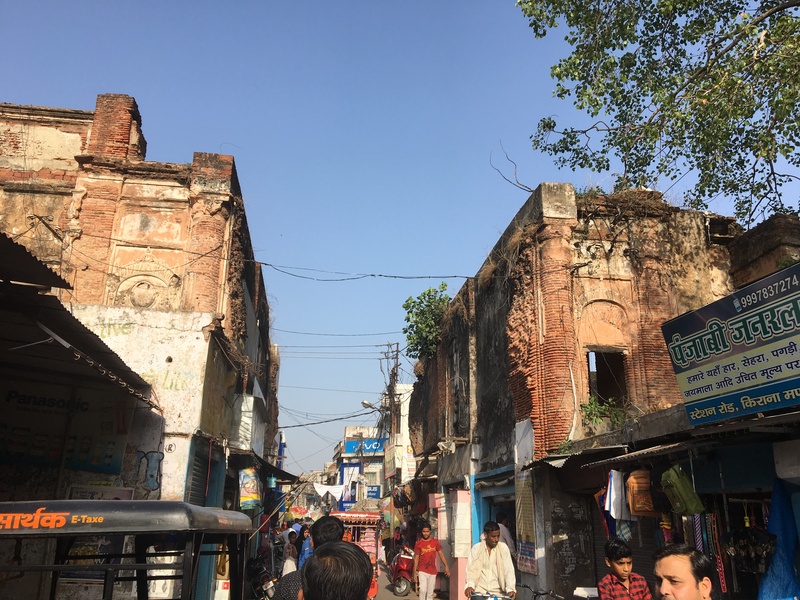 Imperial Gazetteer of India, Vol 11 (1886) by Sir William Wilson Hunter wrote about the market Drummond Ganj that was named after a former District Officer having the substantial number of goods shops located at the main part of the city. This beautiful market was built by the British magistrate Honorable R. Drummond at Pilibhit. There were around three hundred twenty shops enclosed in the four gates. The gateways were arranged in a pattern that gave an appearance of the cross. The northern and southern gateways were approximately two hundred fifty meters apart. The Northern gateway that has been completely lost. Only the few side wall are left as the traces. The eastern and western gateway were approximately a hundred meters away from each other. Ten meters away from the Northern gateways, the connecting roads to the gateways intersect to form the crossroads. The eastern gateway that is opening towards the station road and the market around it. 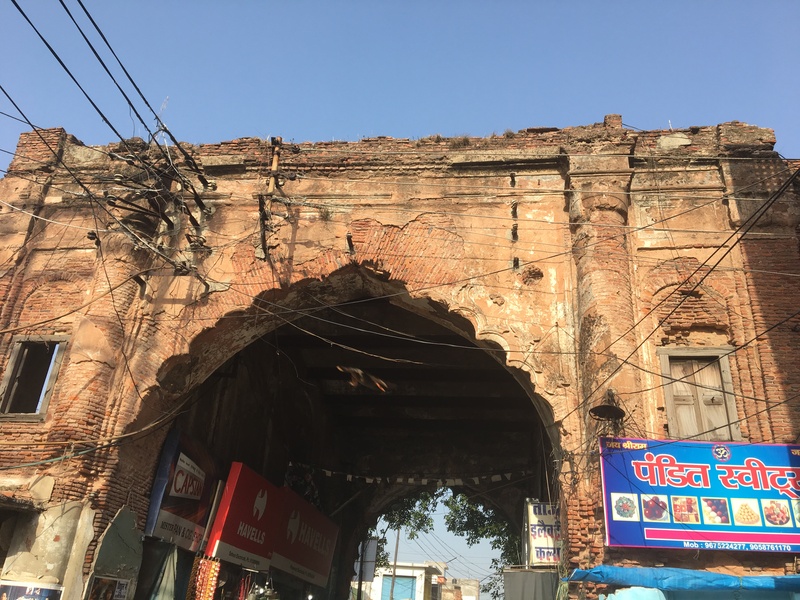 Made up of Lakhori/small bricks and red lime (Surkhi Chuna), the outer plaster has carved floral designs that have been lost in most of the gateways. 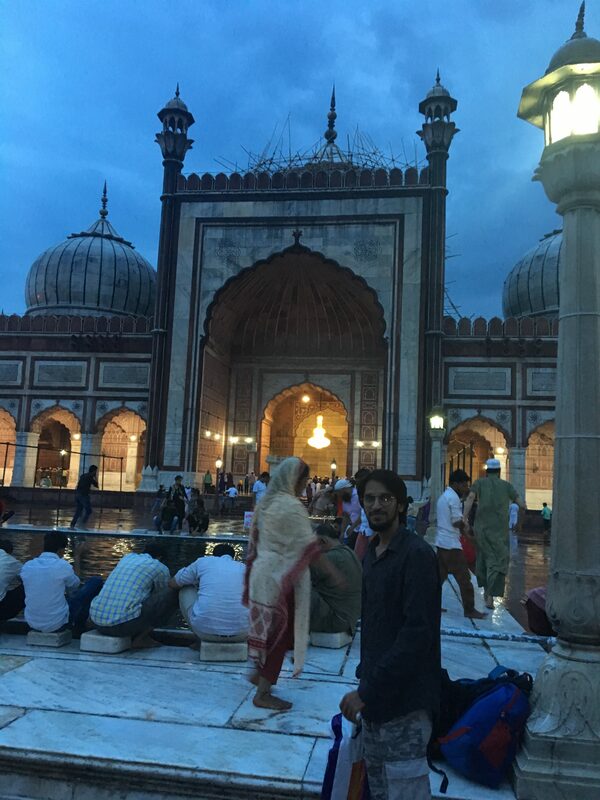 Each gateway is beautifully designed in an Indo Saracenic pattern with arches, Taakhs, and minarets. The roof has the vaulted appearance but not like a dome. Only on the western gateway, the roof has been survived. Its made up of small concave vaults supported by iron grids. The inner walls of the gateways have the curved enclosures fitted with wooden frames with the doors that lead to the chambers. The outer section also has similar arched curves that have the opening for the windows of the first floor chambers. 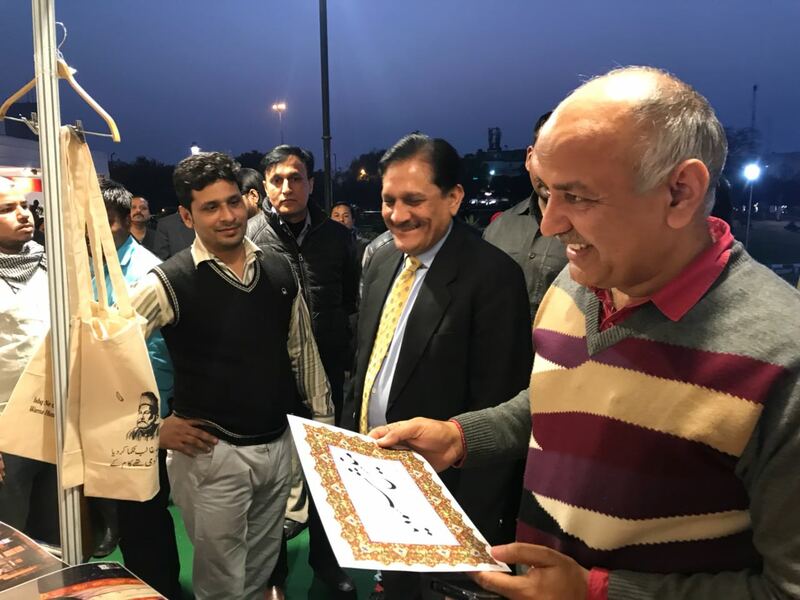 The income generated from this market was endowed for promoting education among the locals of the community at Pilibhit. I was not able to found the construction date of Drummond Ganj but an approximate idea can be built by the reference where it has been cited. One of the oldest references is the Stewart report of the Public education of North-Western Provinces published from Benares in 1859. 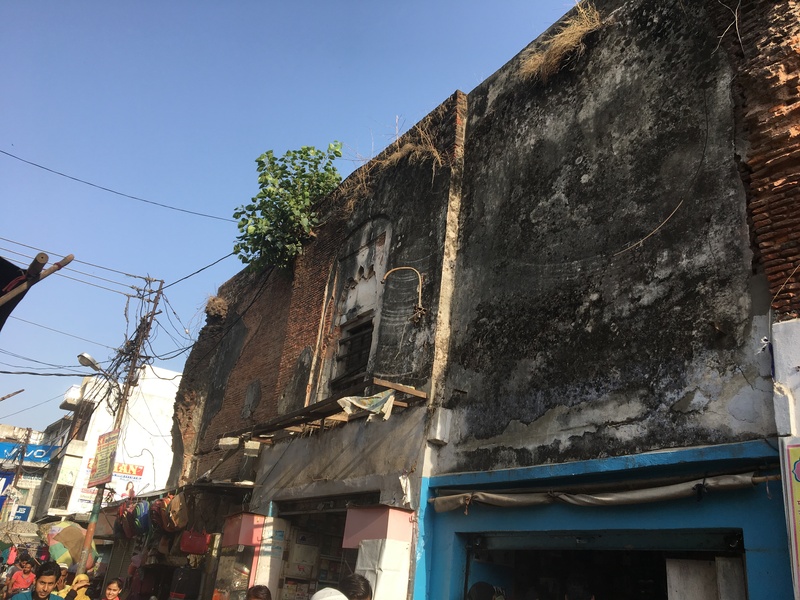 The report quoted “The Pilibhit school is maintained by the local funds, the proceeds of the Ganj built by Hon’ble R. Drummond, for many years, the joint magistrate of Pilibhit, Rs 15, the pay of the master of Tahsil, amalgamated with Anglo-Vernacular school is the only item of the expenditure which defrayed by the Government“. From this account it appears, that Drummond Ganj was constructed before the formation of District in 1879 and even before the mutiny in 1857. 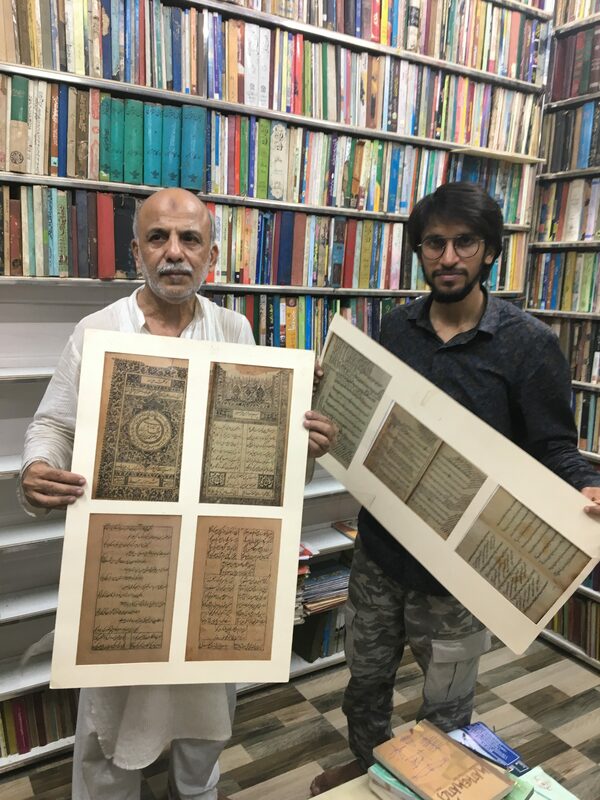 Mr. Shahbuddin, a senior citizen from Muslim Khatri (Punjabi) community whose great grandfather, Sheikh Jiwan Buksh build a grandiose haveli closeby Drummondganj before 1857 narrated the similar version of its construction as an endowment for the educational cause for the locals. The book life and works of Sir Syed Ahmad Khan by GFI Graham (1885) also reflected on the educational inclination of Drummond. 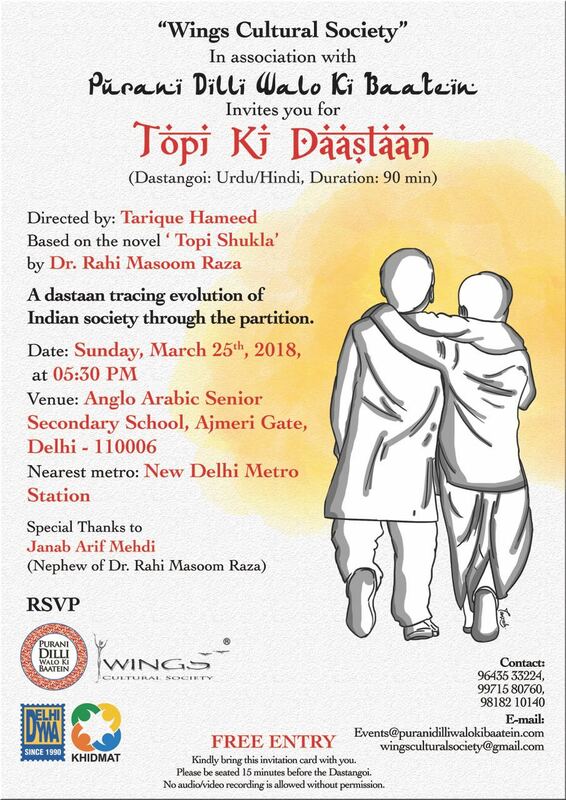 The book cites “In 1864, Hoble R. Drummond presided over an educational meeting at Badaon that was attended by Sir Syed Ahmad Khan and the latter also delivered a speech in the convocation“. Later in 1908, H.R. Nevill Gazette also talked of Drummond Ganj endowment that covers the expense of the Pilibhit School. 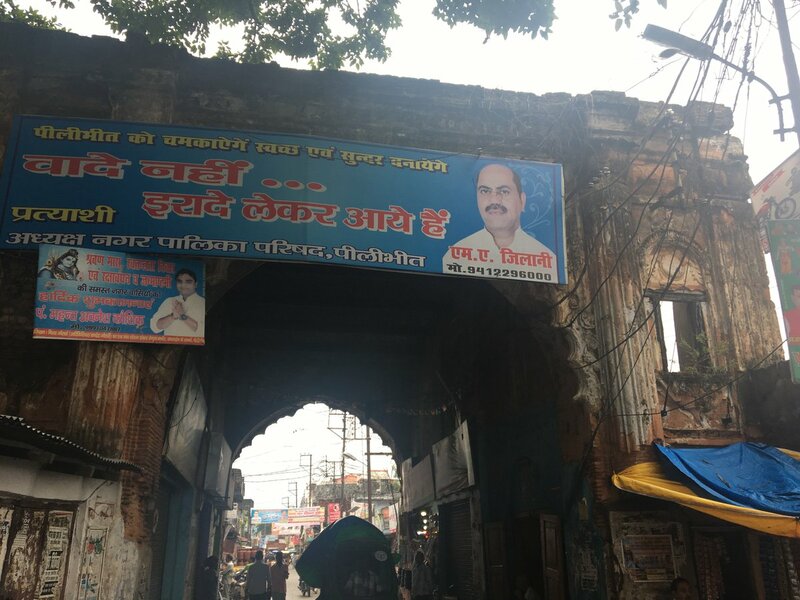 It was after his great contributions towards the education of the Pilibhit, the government high school and later on the intermediate College was named as Drummond Inter College. Almost thirty years before during our childhood days, the four gateways of Drummond Ganj were in better condition. 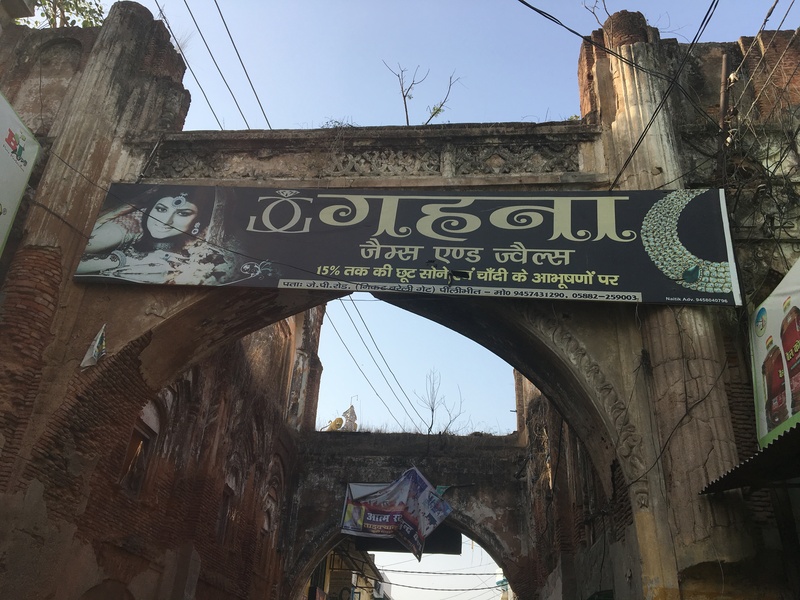 The southern gateway that was facing towards the road to Bareilly was popular among locals as “Bareilly Darwaza”. The ground floor has the number of shops occupied by the tenants. The first floor was occupied by registry department issuing death & birth certificates. Among the four gateways, it was completely intact during those days. During the year 1999, I visited this office thrice to get a death certificate of my late maternal grandfather. The Southern gateways that also houses many government offices till the year 2000. Now completely crumbled. 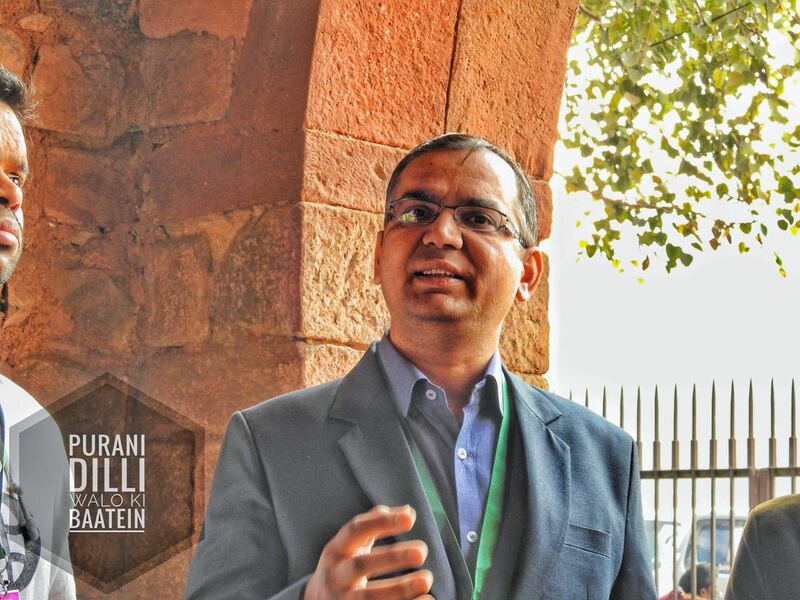 Also popular among the locals as Bareilly Darwaza. Though shabby and stinky, it was not expected to crumble down completely in the next twenty years. With time, the government offices have been shifted to newly constructed larger office spaces in civil lines. In the last two decade, the vaulted roof has fallen down. The shopkeepers secured their own space but the surroundings of the gateways degraded with time. 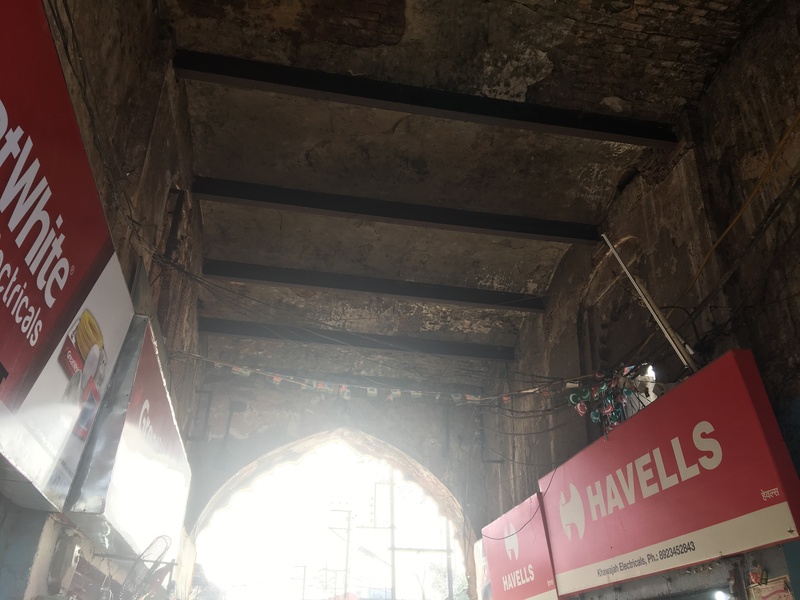 Most of the shopkeepers sitting in these historic gateways are either Hindu Banias and Muslim Khatris ( Shamsi/Punjabi Muslims) who form the major bulk of trading community from the time of Ruhelas and later on Britishers. 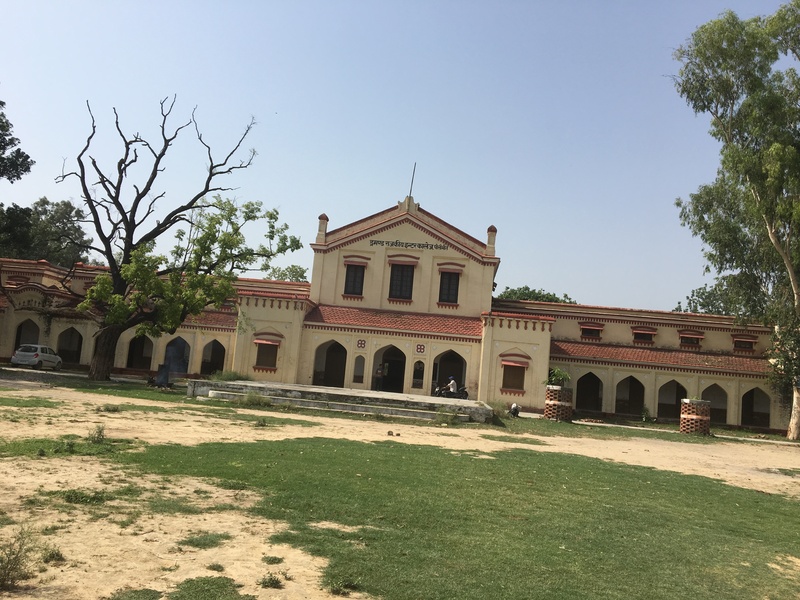 When the beautiful building of the first government school was raised in 1915, it was named after Drummond as an acknowledgment for his great efforts. This building was raised in 1915 as the permanent allocation for the high school. It was named as Drummonds school as an acknowledgment for the great man whose efforts lead to the first school at Pilibhit. After independence, this was elevated to Inter College in 1952. A tablet in the Hindi language hanged in the main hall of Drummonds Inter College. It articulated the efforts of Drummonds to create an endowment from Drummonds Ganj that facilitated in the construction of this school. Though some historical inaccuracies are also noticed in information. 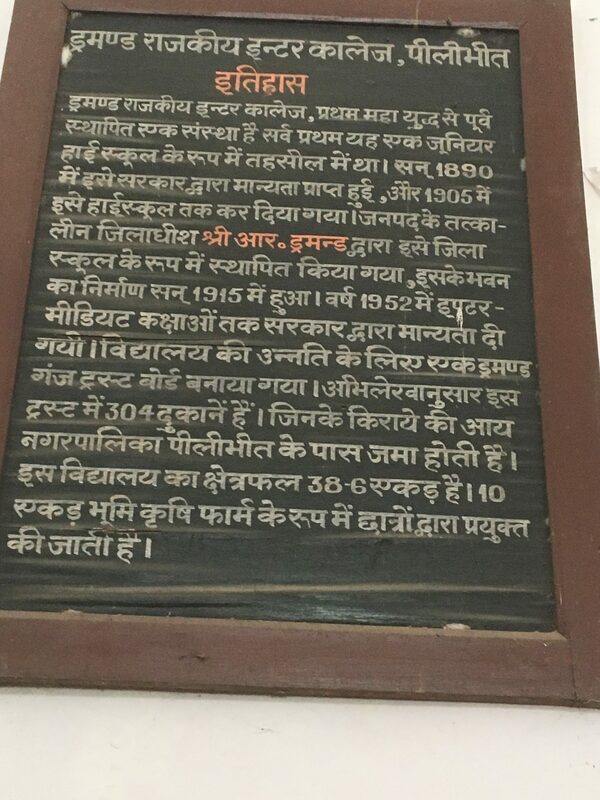 It says the school was inaugurated by Hon’ble R. Drummond, the magistrate of Pilibhit in 1915. From the references that I cited in the article showed that R. Drummond was the magistrate of the Pilibhit before 1857. After independence, it was raised to the senior secondary level and documented as State Government Drummond Inter College. Unfortunately, the local civic authorities became dementic regarding the legacy of Drummond that endowed the money for running the first educational establishment of the city for almost a century ago. This is a real unfortunate face of many crumbling monuments in small cities. 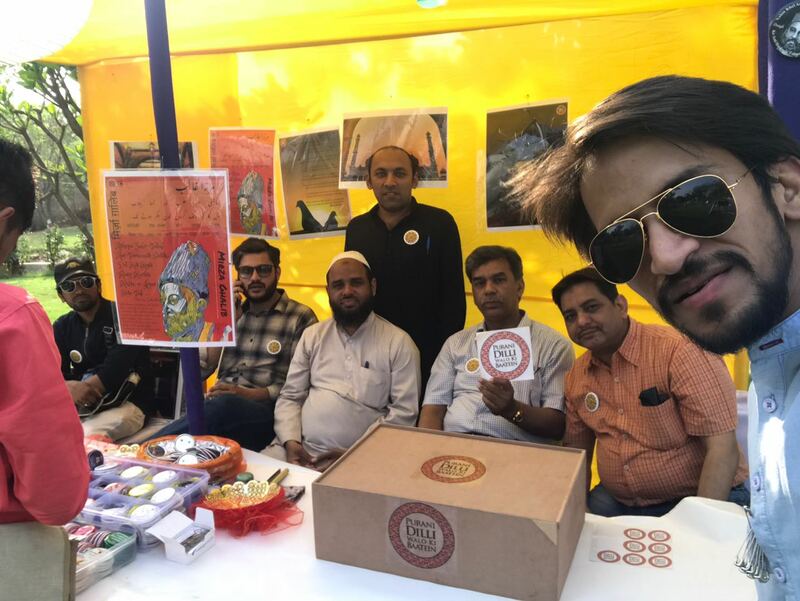 A small effort in this direction can help to save our heritage. Hunter, William Wilson. Imperial Gazetteer of India... Vol. 11. Trumbner & Company, London, 1879. Henry Stewart Reid, Report on the state of Popular education, in the North Westen Provinces, for 1856/57 and 1857/1858, Published under the authority of the Government, Benares, Medical Hall press, 1859.